Growing up in the modern world, our children have to cope with an ever-increasing amount of stress, which can feel worrying to both them and us. 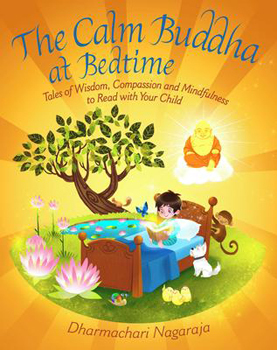 The ancient wisdom of Buddhism, with its emphasis on peace, mindfulness and compassion, is the ideal basis for helping any child face these challenges with inner confidence and calm. Building on the age-old art of storytelling, this beautiful book retells 18 ancient Buddhist tales in a way that is thoroughly fun and accessible to children. Featuring original, full-page illustrations, the stories will transport children into imaginary worlds of enlightenment and discovery. Here, they will meet all sorts of delightful characters and discover easy-to-understand Buddhist messages that will empower them to think about how they can apply values such as patience, honesty, authenticity and generosity in their own lives. Designed either to be read aloud by parents to their 4-8 year olds or to be read by the older age range on their own, these compelling narratives help to focus and calm the mind, providing a soothing transition into sleep. And the selection of gentle mindfulness meditations at the end provides an extra practical dimension that can be used at any time to help enhance a sense of a calm and contentment.